Japan will announce the results of its first-ever solar auction on Nov. 21. The aim is to reduce costs in one of the most expensive countries to generate electricity from the power of the sun. That’s a big deal because Japan is also one of the largest producers of solar power globally, leaving power users to foot the bill. The auction will award a total of 500 megawatts of solar capacity to developers proposing to build a station with a capacity of at least 2 megawatts. Competition lowers costs. France’s contract prices fell by more than half in the three years after it introduced an auction system that forced solar generators to compete on price. Germany had a similar experience. 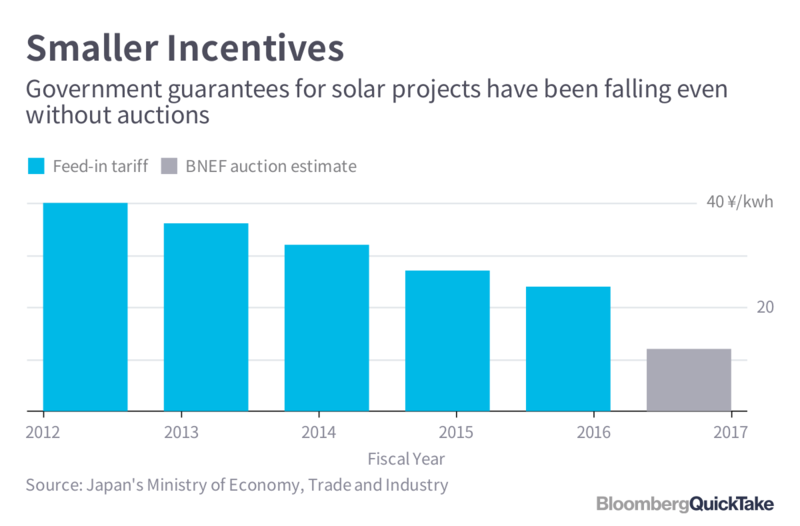 Japanese producers can expect a drop of as much as 50 percent in the rate they’ll get for selling electricity from solar stations compared with the 2016 tariff of 24 yen per kilowatt-hour, according to estimates by Bloomberg New Energy Finance. The support, known as the feed-in tariff, is currently set by the government. 2. So the aim is to reduce government bill? 3. 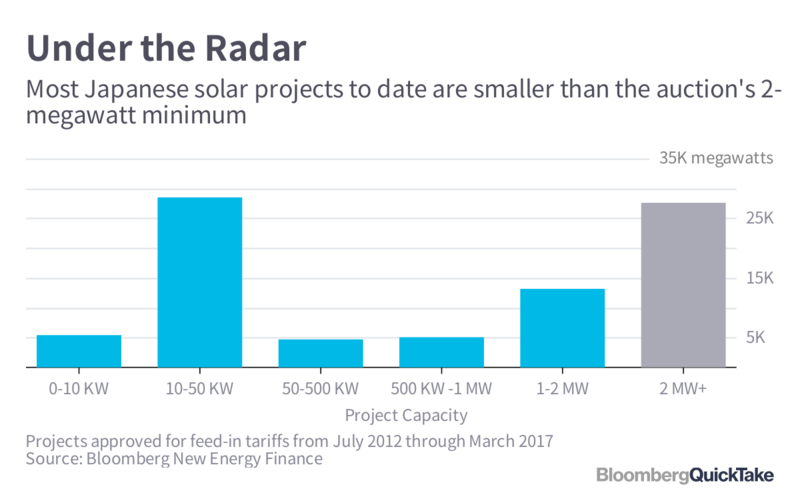 How big is Japan’s solar sector? It ranks second in the world behind China for capacity and generates about 5 percent of its electricity from the sun. Japan’s solar capacity could reach more than 63 gigawatts by 2019, according to BNEF data. By comparison, the U.S. had almost 42 gigawatts of solar at the end of 2016. 4. How expensive is Japanese solar? Only Indonesia and Namibia pay more, according to data compiled by BNEF. Yes, the subsidy has been falling since the government set it at 40 yen per kilowatt-hour in 2012. (That was when Japan introduced the so-called feed-in tariff program that pays renewable businesses to generate electricity, aiming to diversify the nation’s energy sources after the Fukushima nuclear disaster in 2011.) And yes, the rate was lowered every year to reflect declining industry costs. But it remains out-of-sync globally. 5. Why does solar power cost more in Japan? A project last year would have required 300,000 yen ($2,667) in capital costs per kilowatt-hour, three times higher than some of the cheapest facilities in the United Arab Emirates, Japan’s trade ministry estimates. The UAE benefits from little or no expense needed for site preparation and lower labor costs, while Japan has the added burden of natural disasters such as typhoons. The Middle East and other regions also have more days of strong sunlight. 6. Aren’t prices tumbling globally? Indeed. Solar power is now cheaper than coal in many places and in less than a decade is likely to fall below wind and natural gas to be the lowest-cost option almost everywhere. But it’s not just the price that’s tipping the balance. Innovations like solar panels that double as roof tiles and progress in the battery technology needed to even out the power flow on nights and cloudy days are offsetting fading solar subsidies. 7. How will the auction work? With bids capped at 21 yen per kilowatt-hour, the government will select the developer offering the cheapest tariff and keep picking winners until the total capacity allocated reaches 500 megawatts. Results will appear Nov. 21 on the website of the Green Investment Promotion Organization, which is overseeing the bidding process. Two further auctions are planned by the end of March 2019 for a combined capacity of 1,000 megawatts. 8. 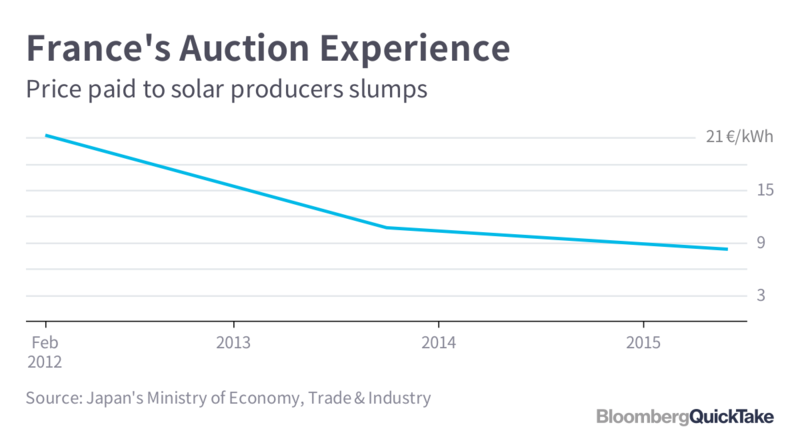 How are Japanese solar developers reacting?